Pear Stairs is the home of elegant and beautiful balustrades, composed of metal and wooden spindles which reflect the historic architecture of Cambridgeshire. Cambridgeshire, in particular Cambridge, is home to an architectural contrast between the old and the new. Historic buildings and cutting edge research both find a home here. This produces a need for both modern and traditional banisters, which Pear Stairs can provide. Wimpole Hall in Cambridgeshire is home to a stunning wooden balustrade. Pear Stairs stocks wooden spindles, known as provincial spindles, which are very similar in design to those used at Wimpole hall. By using Pear Stairs' provincial wooden spindles in your home, you can create your very own exquisite custom built banister. Cambridge is renowned for its stunning metal spindles, found in staircases such as the one in Perse School. Metal spindles can also be found throughout the county of Cambridgeshire, on balustrades such as the ones at Kimbolton castle, which were created by Giovanni Antonio Pellegrini in 1708. Pear Stairs has taken the inspiration for its own line of wrought iron metal spindles from these classical styles, such as Beaufort and Edisto metal spindles. 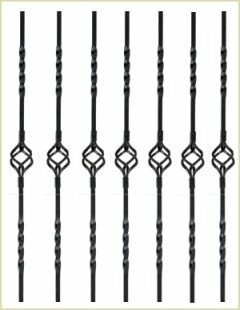 Pear Stairs also supplies Savannah metal spindles, which would make any Cambridge home look as elegant and luxurious an eighteenth century estate. Cambridge’s modern side is inspired by its world renowned research in software and bioscience, which, fittingly, also produced one the greatest scientists of our time; Steven Hawking. Cambridge therefore also has many modern buildings which in turn require modern balustrades. Pear Stairs provide combination wooden and large bubble acrylic spindles ,which would produce a contemporary, ultra-modern look for any Cambridge banister. Pear Stairs stocks these spindles in a range of timbers, including oak, ash and hemlock. 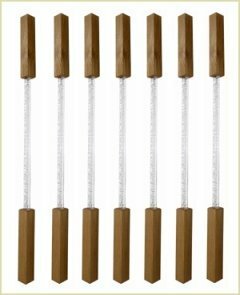 Pear Stairs stocks a large array of visually stunning wooden and metal spindles, which can fit any style of Cambridge balustrade, be it modern or traditional. 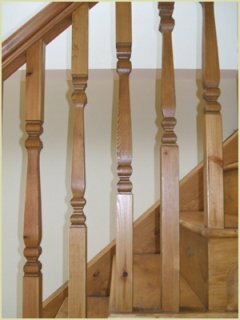 This variety makes Pear Stairs the ideal choice for any Cambridgeshire banister.